Florals & Stripes & Ruffles: More Paper Doll Fashion in Color! Yesterday, I posted this paper doll in black and white. Today, she’s going up in color. I’m not sure if I like doing this whole… one day black and white next day color thing. It sort of defeats the point of being able to reduce workload. I might start spacing them out a week, depending on how things seems to work out as I get into the crazier time of the year for me. I went back and forth and back and forth about so much with this paper dolls color scheme. As I often do with questions of paper doll fashion, I think I spent more time on it than was totally rational. I wanted her to be stylish, but not overtly girly. I couldn’t decide between pinks and blues and then I originally conceived of the blouse as being burnt orange with teal flowers. Yeah… that wasn’t my greatest idea ever. In the end, I settled on a color scheme that was cheerful (which I think we need on these grey days of winter) and mix and matched pretty well, though not as perfectly as some of my other paper dolls have done. There’s really only nine outfit options here, and I think I’d like to do more, but the dolls are fairly large and that limits how much clothing I can fit on a page with them. I have been thinking about doing some sets that are “clothing only” as I have always liked clothes more than dolls, but I don’t want to disappoint people who feel otherwise. Paper doll outfits or dolls? That’s always the most complicated of questions, isn’t it? For my second Bodacious and Buxom paper doll to color and print, I wanted to do something modern. Most of my readers know my love of fashion magazines and I wanted to create a mix and match set that felt contemporary and contained things I could imagine a stylish girl wearing when she walked down the street. I try to be diverse in my paper doll production, both in theme and in ethnicity and in style, so today’s paper doll is a stylish black girl with some mad-happening afro-puffs. So many “modern” paper doll sets are very very frumpy and I try very hard to avoid frumpy when I make my paper dolls. Frumpy is not something I want my paper dolls to be. Plus, since the Bodacious and Buxom paper doll represent curvy girls, I really don’t want to go frumpy. Just because you have some curves does not translate in to wearing a sack. I do try, however, since I am not black myself, to be respectful and aware of trends while I am drawing. I think you have to approach such things from a place of learning and willingness to be corrected as needed. Also, while I was wandering around the web, I came across a blog I’d never seen before called Paper Doll World. 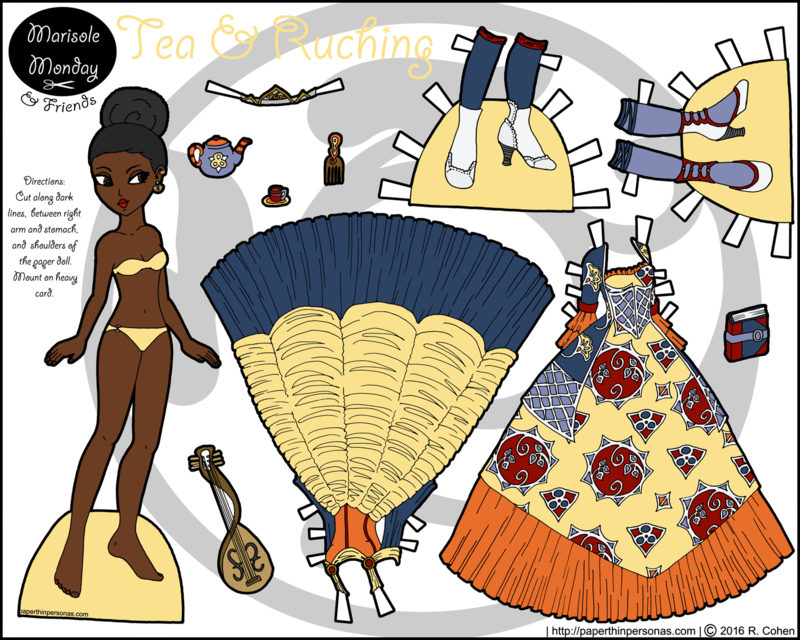 It’s a fun blog devoted to one of my favorite topics (paper dolls) and the dolls are very cute. They remind me of some of the dolls I drew as a child, which is fun.